While many people do it every year, it’s illegal in Missouri to participate in NCAA “March Madness” brackets when money is involved. That’s according to Missouri Gaming Commission general counsel Ed Grewach, a former prosecutor. “Participating in a NCAA tournament bracket would constitute gambling and since it’s not in one of the authorized legal gambling scenarios set out in our (Missouri) law, it would be illegal,” Grewach says. 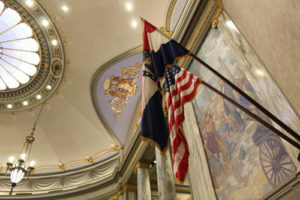 Grewach says state law bans gambling unless it involves casinos, the Missouri Lottery, bingo or raffles conducted by charitable/religious organizations. “In Missouri, they define gambling as having consideration, chance and prize,” says Grewach. Grewach emphasizes the Missouri Gaming Commission is not doing an awareness campaign, and is responding to Missourinet’s inquiry into the issue. NCAA “March Madness” bracket pools are done in many offices each year. Grewach, a former prosecutor in northeast Missouri’s Lincoln County, says it’s up to local police to investigate. “If someone would file a complaint about this type of activity, it would be up to local law enforcement to determine whether they wanted to take any action or not,” Grewach says. The 2018 NCAA men’s basketball tournament is underway.